Snapchat is the fastest growing social network. While being a favorite social media amongst teens for a while now, Snapchat has been making its way around, becoming a new favorite tool for marketers and entrepreneurs. I’ve been using Snapchat for a few months, and it changed my life. Hillel Fuld, the Scoble of Israel, turned from a non-believer to a faithful preacher and a star of the platform within a few months. 77% of Snapchat users are above 18 years old ( 26% are between 25-34 and 37% are between ages of 18-24). Snapchat has over 6 Billion video views a day (and that’s from 2015). What’s interesting about Snapchat, is that in oppose to other social media platform, a lot of its features are either hidden or based on its user’s creativity, making it hard for newcomers to fully enjoy the platform’s potential. Every user that I’ve met had their little hacks and secrets, uncovering functionalities or simply creative tricks to get more out of the platform. 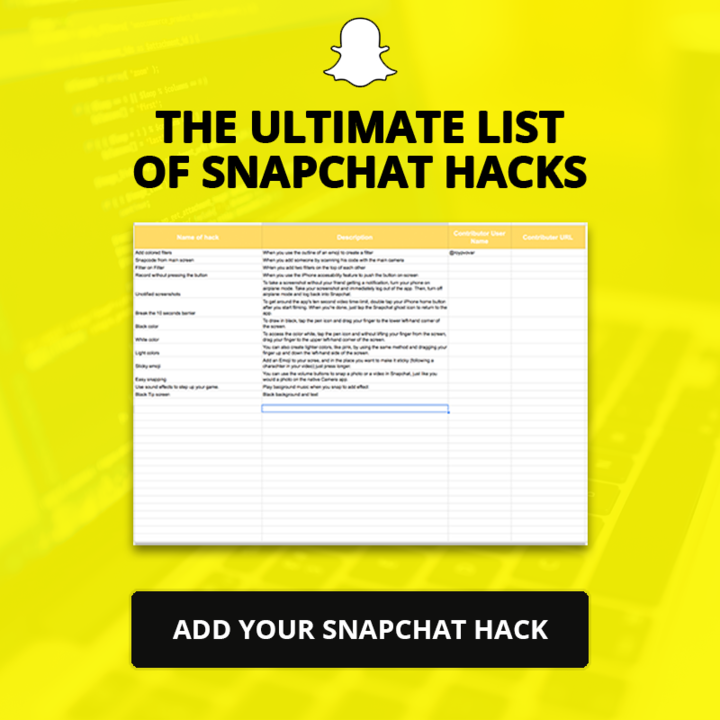 Following the success of our “Ultimate Growth Hacking Tools” spreadsheet, I’ve decided to use the power of the crowd to be an ultimate list of Snapchat hacks. Everybody can add, edit, copy and do whatever they want with the spreadsheet and its goal is to become a resource for as many users possible. 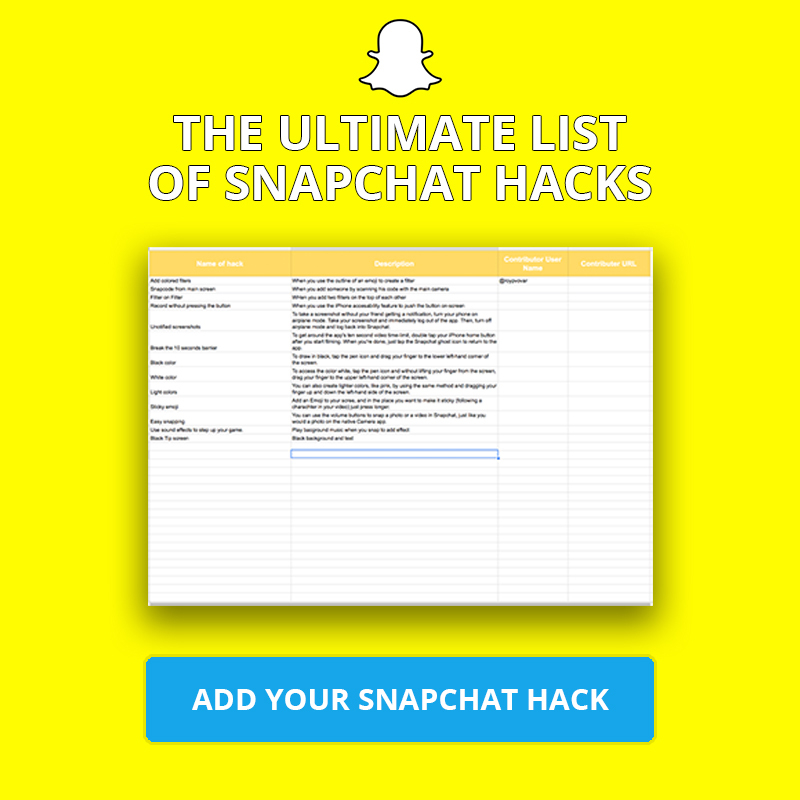 Click here to get into the list and add your hacks. Because Snapchat has a pretty bad discovery mechanism, finding cool people to follow is hard. That’s why I’ve added a column where you can also share your username after adding your hack. People who know cool hacks, are usually worth following, right? So come on – Click here, and start adding your hacks.